This week we chose Marvel’s Brian Michael Bendis flagship title, The New Avengers, for our roundtable review. I figured we’d be stirring up for a good blog slapfest, since Jim Doom is one of the biggest Bendis fans around, and Fin Fang Doom bleeds in his intestines just from reading a Bendis-penned comic. Me? Call me a fence-sitter. I used to love Bendis, then I got sick of him, now I think he’s pretty good. I started reading New Avengers a few months back, then broke down and bought last month’s issue and now this one, both of which focus heavily on new villain The Hood, who’s trying to organize a criminal syndicate. I was looking forward to this issue, since the last one was pretty darn slow (the heroes sat around for the last two-thirds of the book and talked), and the cover to this one shows a symbiotic Wolverine with claws bared. Excitement! Except… Not so much. We get one panel of symbiote-infused New Avengers attacking the Mighty Avengers, on one of the book’s last pages. So, thanks to Marvel marketing, this book really had no chance of living up to expectations. Instead of showing us how the New Avengers were overwhelmed by the symbiotes, or any of that earth-shattering fight, we get two-thirds of an issue of the villains sitting around and talking. For once, I didn’t ever feel like Bendis left a huge thumbprint on the issue. It was just boring. Incredibly boring. Those yawner scenes had some predictably nice dialogue and character moments, sure, but they could’ve advanced the plot just as much and been trimmed considerably. It’s especially frustrating since we didn’t learn much more about the Hood, except that he’s well organized and he wears jeans. There were a couple of nice scenes at the beginning and end of the issue, but all that does is qualify it as a turd sandwich. Yum. How awesome is The Question? Let’s dive into the pages of the recently released The Question: Zen and Violence for the answer. In case you’re unfamiliar, this collection brings back the run by Dennis O’Neil on the now recently deceased Vic Sage version of the Question. It starts with Vic as a crappy hero who gets his skull crushed, then eventually comes back to wreak havoc on criminals. Courtesy of Denys Cowan and Rick Magyar, we get full pages of intricate fights, orchestrated just about as well as they can be done. This, of course, is the Violence part of the title. Where does the Zen come in? Umm, yeah. I guess that’s it. I mean, I knew Zen was all about inner peace, I just didn’t realize that’s how you go about it. Vic Sage: Total badass, award-winning journalist and world’s most flexible man. Now, I know you’re wondering the same thing that I’m wondering. How does he do it? How can one become as great as Vic Sage? Is there a path that doesn’t include making numerous hikes up into remote mountains and sitting in an ice cave until you decide to stop being a lame-o? Yes, yes there is. She’s long been the super-powered, lasso-wielding harbinger of justice as Wonder Woman, and post-Crisis she created a secret identity and worked for the very government agency trying to track her down. Oh yeah, somewhere in there she tried her hand at masseuse. Now, a new identity for the princess of the Amazons. Exotic dancer, coming to a party near you! This comes from Wonder Woman #13, out this week, which actually wasn’t that bad, gratuitous booty aside. This week, I picked New Avengers for our Book of Doom. I guess I was skittish because most the new books we tried in the past ended up sucking. Had I gone with a new book, it would’ve been Simon Dark, the new effort by Steve Niles. After wading through the absolute atrocity that was Niles’ City of Others, I was even more skittish. DC was nice enough to send a review copy, though, so I couldn’t avoid it. And, while this book isn’t a contender for debut of the year, I was surprised by how much I enjoyed it. The book starts with some goons wearing masks about to sacrifice some dude in the grounds of a destroyed church in Gotham City. Suddenly, a weirdo who looks like Madman meets Edward Scissorhands meets The Crow shows up, does some acrobatics and slices off the head of a bad guy. Ouch! Thing is, this new hero, aka Simon Dark, knows his name but has no clue who he is or where he came from. The rest of the book is mostly scenes of everyday life in Gotham, with Simon off at the edges, the dispassionate observer. Judging from Niles previous work, I expected a full horror book, but this is more creepy and haunted than terrifying and grotesque. It’s understated, which is a welcome 180 from City of Others. 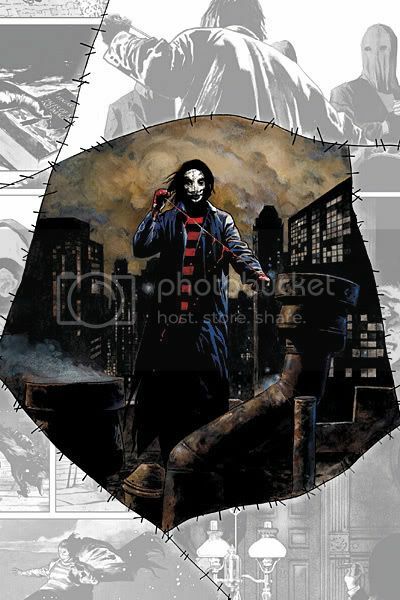 Though there are a few slow moments and some character introductions that show no importance here but obviously will become crucial later on, this first issue effectively establishes the framework of the series: This weird cult of hooded bad guys are actually from the city’s upper crust, and they’re planning more sacrifices and killing Simon. I didn’t read Gotham County Line, which was the previous team-up between Niles and artist Scott Hampton, but Hampton’s work is a good fit for this. He uses the same gritty, realistic style that’s been done perfectly for a while now in Marvel books Daredevil and Captain America, and to a lesser extent in Boom! Studio’s books. One thing that seems like a bad choice for establishing this new character is setting him in Gotham City. Batman overshadows everything there, not to mention all the other heroes calling the city home. It’ll only distract from Simon’s story if readers are constantly wondering whether Batman or The Question or Robin will show up. Of course, if sales of Simon Dark don’t meet expectations, they probably will. Let’s call this the Homecoming edition of our weekly Heroes wrap-up. A few central characters had been MIA since last season’s finale, but now they’re back. Was it a good Homecoming? Well, it far exceeded any I experienced in high school. Of course, that’s not saying much at all. So, what happened? Who returned? Who died? Did the writing improve at all? How many Nissan Rogues would show up? Dumb criminals — I’ve been intrigued by the Alejandro and Maya-the-crying-chick arc, but man did it ever take a turn for the stupid here. They’re in Mexico and trying to get to America, so what does Alejandro do? He busts out the window of a car in broad daylight in the middle of a crowd with a cop standing nearby. Who would’ve thought such a thing could’ve landed him in the clink? Packin’ heat — You have to wonder if the writers are making a joke of Parkman and his position with the NYPD. As I mentioned from episode one, he’s a bit over zealous with the firearm. More of the same here, as he wakes up and immediately pulls the hammer and nearly shoots Mohinder. A tip to Mo: You live with a nutjob. Might want to let him know when you’re coming and going. Sylar’s back — In case you missed the episode and the 20,000 commercials NBC aired last week, the man the world loves to hate has returned, albeit with a big hole in the chest and apparently no powers. More questions to come. Weekly WTH? — In a single scene, Ando pulls a huge sword from a small cabinet (seriously, how did that happen?) and then finds a note for him on the bottom of the hilt, revealing a secret storage spot for notes from Hiro-in-the-past. So, a famous sword has been studied by historians for ages, yet they all miss a series of notes hidden not-ver-well in the handle? There’s a word for that: unbelievable. Speaking of — It’s nice to know the actor who plays Peter spent the summer lifting weights and waxing his chest. But, seriously, at least come up with a reason for him to take his shirt off. He’s like one of those guys at the gym who wears as small a shirt as possible and spends half the day flexing in front of the mirror. Give it a rest. Douche boy — Every superhero should have a nickname, and the dork who’s seducing Claire is no exception. After acting like a total prick this week (after being utterly generic previous episodes), I think he’s earned the moniker Douche Boy. In the past weeks, we’ve picked some downright duds for Book of Doom, our roundtable review. This week’s pick, at the very least, should kick up a lively discussion. See, we Doomers really don’t like each other. And if there’s a lightning rod for this enmity, it’s surely the writing of Brian Michael Bendis. This weekend, we’ll all barricade ourselves in a room and have it out over New Avengers #35. By “room,” of course, I mean the Internet (which remains in one piece). The good news for you is that you can join in by logging on to the Internet, coming here, telling us how stupid we are, and… Oh, wait, that’s all you need to do. How many pop culture references can Bendis fit in an issue? Will the team fight, or just banter wittily? Will Fin Fang Doom finally admit Bendis isn’t the anti-Christ? 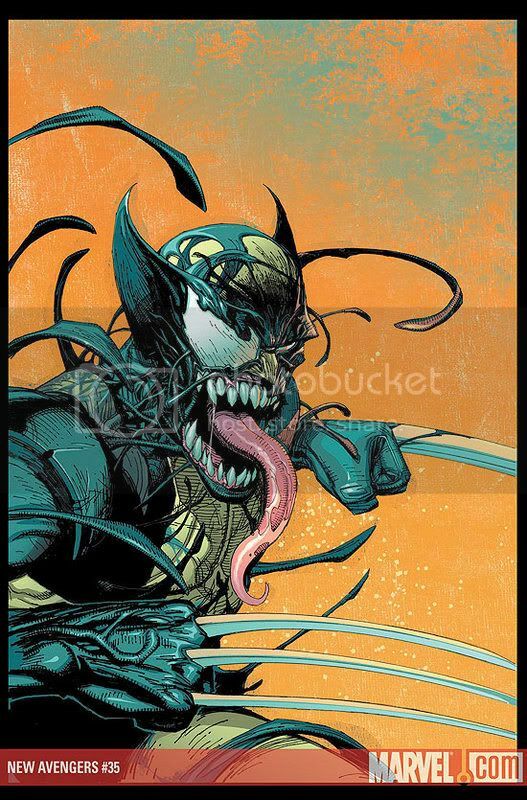 At the very least, we’ll finally have the answer to how awesome it is when Wolverine combines with a Venom symbiote!!! Was that sarcasm? You tell me. A while back, I reviewed Exit Wounds, a great indie book about a young man with emotional problems trying to get a handle on life as he searched for his possibly deceased father. About the same time (I’m a bit delayed here), I got a review copy of Shortcomings (Drawn & Quarterly, $19.95), by the well regarded illustrator Adrian Tomine. Strangely enough, it’s also about a young man with emotional problems trying to get a handle on his life. Notice the difference in those descriptions, though. Exit Wounds had the drama of the missing father to power the poignant plot (alliteration!) along. Shortcomings lives up, or rather down, to its title by suffering from a severe case of the Indie Comics Problem. In other words, we get lots of conversations, lots of moping, lots of depressing slices of life. Just nothing resembling a plot. This book, and the many like it that come out every year, seem to delight in not having a plot, as if such a “false” structuring is far from real and far from worthwhile art. Maybe those predisposed to such thinking will like this book, but anyone (and I’m speaking of the vast majority of humanity here) who understands that people view the world through stories will be bored out of their minds by this book. Thankfully, it’s at least not very long. Grading Shortcomings on art alone, I’d give it a B+. But everything else sinks the ship, so the overall grade is a D-. And the back-up story, which I’ve already forgotten the title of, was just piss-poor. Some annoying guy and some vampire are in a cave and have a stupid conversation about pointless crap. The end. In part thanks to Devon at Seven Hells, but moreso because DC sent over a review copy, I now know that the backup story was called Doctor 13: Architects and Mortality. More importantly, I now know that this story is really, really good. In my defense, I caught only the second part of the story, and that part was easily the weakest. What really hurt, though, was missing out on a bundle of jokes because I’d missed the set up in the first installment. Much like Arrested Development, Doctor 13 strings gags along from the first moment onward, continually building to ever better punchlines. Just read it, and thank me when you get to the banana. Jokes are great, but a book has to be more than funny. And this one is, as Brian Azzarello takes a 180 from his typical work and strings along the most improbable story possible. In short, Doctor 13 and a motley assemblage of DC character chaff face annihilation from the Architects, who are actually DC writers that want to erase these crummy old characters. 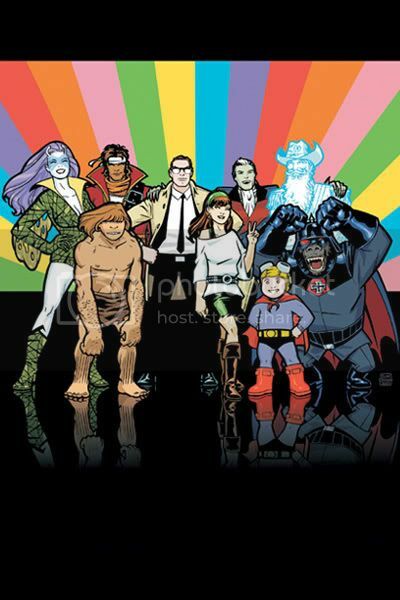 Think Grant Morrison’s Animal Man meets Jeff Parker’s Agents of Atlas. Though probably unintended, the story points to a serious flaw with DC’s editorial staff: that they care more about continuity than they do about characters (though how well either is managed right now is certainly debatable). Azzarello shows that even the lamest characters can be great, as long as the writer cares about them. 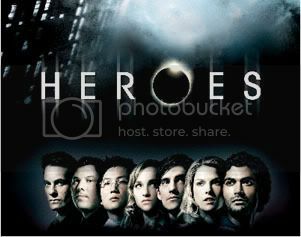 With another episode under the belt, I’m back to continue this weekly Heroes review. But first, I’m still trying to figure out if it’s possible to enjoy Chuck after reading the brilliant and ruthless comments of TV writer Ken Levine. Go read that, and the rest of the blog while you’re at it. We’re not in Kansas – It’s a good thing that Claire and her family moved to California and not Kansas, because if they were in the Sunflower State there would be no way her teacher would ramble on about theoretical evolution in a way that just-happens-to-tie-into-the-show’s-theme. Come to think of it, wouldn’t having a group of genetic freaks stuck in Kansas actually make this infinitely more interesting? Speaking of John Doe and fam – The ongoing travails of the most normal of the Heroes families continues to be the best-done aspect of the show. It’s just too bad that, because of the cast of hundreds, there’s not enough show to really get into all the issues they would face. Like how the mom is coping with years of lying from her husband, or what the heck the creepy son does now that he knows he was brainwashed for years. That guy – This is just really bugging me, but the guy working for “the company” who’s leading Suresh on various missions, you know, the bald goofy actor. I know he’s been in a million movies and TV shows, but I can’t figure out who he is. There’s no point to this, just a little something stuck in my craw. Devise a virus – The “virus” that’s striking down (sort of) the heroes has to be even funkier than that created by Deltron 3030, because how on earth could a virus survive for 30 years and only appear in three hosts? I hope there’s a good explanation for that on the horizon. One hot Haitian – Here’s a suggestion to the “virus” stricken Haitian: Maybe you won’t feel so feverish and sweaty if you pull off that blanket. Seriously, you’re in Haiti. It’s hot there. Blankets not needed. I forgot to include that I read Fall of Cthulhu #6 and Left on Mission #4 last week in my reviews. My bad. Since the folks at Boom! were nice enough to send review copies, they deserve a mention. Though Left on Mission took a huge step up from the past two issues, there’s nothing especially new in this espionage storyline from Chip Mosher and a lot of it falls into tense-movie stereotypes. After a full issue that didn’t advance the plot much at all (but filled in some backstory), we get an issue that sees all the back-room posturing finally lead to action, with a tense bag exchange surrounded by snipers of all stripes. It was a good scene, if not exceptionally illustrated, and did a fine job of cliffhanging for the final issue. As someone who really didn’t like the first arc of Fall of Cthulhu (there were about three times as much dialogue as needed, to the point that I got sleepy from the reading), the first issue of the new arc was a massive improvement and makes the last arc feel like an unnecessary introduction. It starts with a group of arctic explorers hot on the trail of some mysterious thing stuck on a frozen ship. While the first arc was creepy but never suspenseful, this whole book kept a perfect tone of what’s-gonna-happen? I still don’t see in Michael Alan Scott’s writing any of Lovecraft’s irony, but he’s taken a huge step in the right direction, as this was just a strong horror read top to bottom. Greg Scott’s art is also a nice addition.